The Kong Show hosted by Kamasami Kong had an interview with Babs Saito, who works with Tom Moffatt Productions, which promoted the Arashi Blast in Hawaii concerts last year. I just thought of transcribing the entire interview; job hazard maybe, but more like I find a lot of parts interesting, especially the little details on the show in Hawaii. Blast, as Arashi fans would know, had a sort of a redux this year with a four-night concert, this time in Miyagi, to help the prefecture devastated by the Great East Japan earthquake in 2011. H: One of the biggest shows in Japan is put on by a group here called Arashi. They put on a big show in Hawaii but more recently, they put on a big show in Sendai with more than…how many people came? B: There were 200,000 people over four shows. H: 200,000 people over four shows. That’s truly amazing. And that was the voice of Babs Saito. Babs Saito is working of course for the Tom Moffatt Productions. And you guys put up the big Arashi show in Hawaii, right? B: That’s right. Our show was September 19th and 20th of 2014 so when I heard about the Miyagi concerts, I decided to come here because it’s exactly a year later. And I got to see them perform. I was too busy working last year. H: Tell us a little bit about the Arashi show. Why are these guys so popular? They are of course the most popular group here in Japan, right? H: Or the biggest draw at least. B: Absolutely. They are real showmen, they’re quite talented, they’re all very good looking and you can tell that they work hard for their fans. H: Describe these guys, they’re an an all-guy group, right? B: It is, it is. They all have very distinct personalities and each of them has, everybody knows, their individual colors, and their fans know how to tie them in by their colors and so on and so forth. I don’t know much about them individually but the ones I have met have been wonderful people, they’re such sweet people. H: Now, how’s their music? H: Some people don’t think so. B: Well it depends on what kind of music you want. They’re progressive for a Japanese pop band and they’ve sort of come out of that pop thing. They’re getting more into the hip hop and into the bluesy kind of sound and I think it works for them. H: At the show in Hawaii, tell us more about the location, how the people got to the show, who came to the show and how the guys from Arashi arrived. B: Gosh. We had 20,000 fans flown in from Japan for that show. H: How many jetliners was that? B: They chartered more planes than normally flown in from Japan. If they could have chartered more, they would have brought them in. H: I heard there were 12 jetliners…12 747s. B: 12 or 13 of them. Yeah. B: …completely filled with fans. Nobody could book a seat to get here for any other reason. H: And of course the hotels in Waikiki were filled as well. B: Completely filled…Ko Olina was completely filled by fans. And JTB who did the movement for the fan club had to wrangle I believe it was 170 buses. H: And the concert was held out of the country so they had to bussed from their hotels to where? B: Ko Olina Resort which is on the beautiful ever coast of Oahu. Nobody has ever held an event this large at that site, it was a logistical nightmare but Ko Olina was cooperative and Arashi was cooperative and all the potential litigants were cooperative (laughter) and we put on the biggest show that was ever put up in Hawaii. H: And tell us about that stage. H: It was a construction project, right? B: It was a construction project. We were there for a month from start to finish so three weeks of build-up and one week of texturing when we put up the white linens and the dressing on the LED screens and so on and so forth. We had 5 to 600 people working on construction and design and they brought in from Japan the moving stages! H: Five to 600 people working on it? Five to 600 people got jobs as a result of this concert? Arashi? B: Oh yeah. It’s phenomenal. Not to mention that JTB had an army of people working in Waikiki while we were working on the stage, they were working to try to take care of 20,000 fans. So it was an operation. H: And you said…tell us about that stage. You said it had various moving parts. B: We couldn’t put it in our stadium. Aloha Stadium wouldn’t fit it. And there were 15,000 chairs that we got. Arashi wanted to give the fans something to remember the show by so we shipped it…oh, excuse me. Thirty thousand over the two nights of little chairs that they could sit on with Arashi Blast in Hawaii on them, so that they could actually sit off the ground and wait for the show to start. H: Souvenir chairs? And they had a chance to keep them? B: Not for the fans. B: No meet and greets. H: How did the boys from Arashi arrived? I understand it was a show in itself. B: They arrived by helicopter. It was incredible. H: I’m surprised they didn’t arrive coming from a canon blast, you know like in a circus. B: I think if they had the chance to do it, they would have arrived by jet ski because we were right on the edge of the ocean. B: But helicopters are not used in Japan often for this type of thing? So it was a treat for them to do it. And they knew that their fans would get a kick out of it. So they all got to watch the video screens while they were taking off from the helipad and then they could see the helicopter coming closer and closer and then they started to scream louder and louder. It was terrific. H: Wow. It must have been a chicken skin experience to say the least. B: We were all at the end of it proud I guess that they allowed us to be part of their event because you know, you don’t see that spectacular kind of staging and choreography and costuming. Just most groups you know…the Elton Johns and so on and so forth, they have their own trademark look and sound and what not. But Arashi is like the pinnacle of lighting and sound and video and fireworks! H: Now of course, being with Tom Moffatt, you guys have produced some of the biggest concerts in the world. You just mentioned Elton John but Tom Moffatt goes all the way back to producing concerts for Elvis Presley, right? H: You wanna drop a few names of some of the other big concerts that you promoted in Hawaii? B: We’ve done the Rolling Stones, we did Michael Jackson’s final stadium concert ever, it was in Hawaii. Janet Jackson of course, Mariah Carey, Whitney Houston, gosh…the Rolling Stones, Jimmy Buffet of course, the list goes on and on and on. H: You guys have done the biggest concerts in the world. And you would say Arashi is bigger than any of those concerts? B: I would. Now some people might argue with me. But in the case of support and fan base and just the sheer energy they put up in their live shows, no one beats them. H: How about the sound at an Arashi concert. Is the sound as crisp, clean and clear and full as it would be, say, at a Rolling Stones concert? B: Absolutely. It’s world class from start to finish. The lighting is impeccable. When fans see the video, if they haven’t been to the concert already, it’s already for DVD quality. It’s that good. The effects are laid in, the timing is perfect, they have an incredible crew so you know…everything is topnotch. H: I see. So they bring their own sound people? Their own camera people? Their own lighting people? B: Yes. And they have a core crew that’s just so wonderful to work with. H: Now I’m sure there are other people listening in other countries, other promoters who are thinking right now maybe I should bring these guys to Chicago, New York, Los Angeles, Singapore…what would you say to them? H: What would you say to other promoters in other countries and other cities that might be thinking of bringing Arashi into their city? B: I think they should really consider it. Arashi has a fan base that’s willing to travel. They have fans around the world. In fact, we had fans from Peru who came to Hawaii to see them last year. B: From Peru, yes. That’s a long way to come for a concert. B: Sure I can consult. I love those boys. I’d do anything for them. H: Arashi. Don’t miss them when they come to a city near you. 1. It seems Mr Kong is a Hawaii native who is now based in Tokyo and doing all sorts of radio shows so his “lack of knowledge” about Arashi is kind of understandable. On the other hand, it may also be an interview ploy to sound as if he hasn’t done enough research about the group he wants to talk about in order to get more information from the guest. But just the same, it was an interesting interview, especially the nitty gritty about the Hawaii concerts. 2. Babs Saito mentioned that those she met in Arashi were sweet so I reckon she did not meet all five? I’m guessing she must have met Jun as the production banchou, Sho as the “international spokesman” of the group and most probably, Riida too, as the leader of course. Or maybe she has seen them but never really had the chance to talk to all five. 3. Mr Kong said “chicken skin” experience and I had to look it up (I thought it was some street food LOL). It is apparently a Hawaiian term/slang for goosebumps. 4. Babs Saito said something about Arashi getting out of their pop mold and going into hip-hop and blues. Um, since their debut single A.Ra.Shi, they have been categorized in the hip-hop genre and they’ve been singing blues even before Blue. 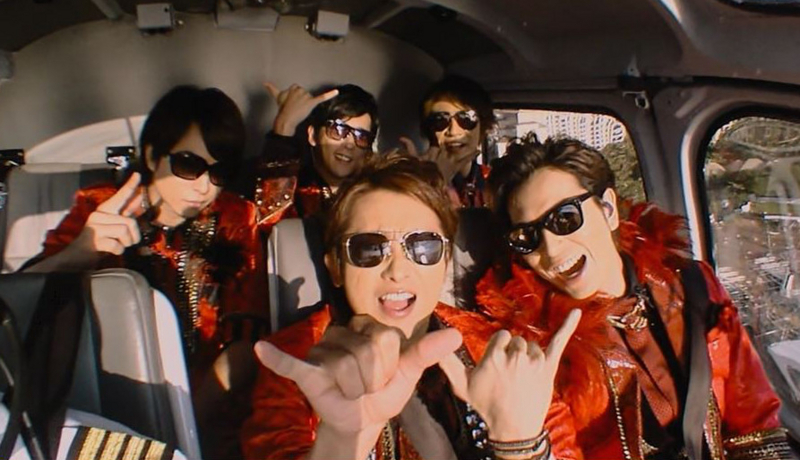 If I’m asked what genre is Arashi, I’d say they’re into everything and they have become my genre-breaker. They’ve experimented with digital and EDM music in last year’s Digitalian album and is going into “Japonism” in the album to be released on October 21, which may as well be a fusion of traditional Japanese music and contemporary sound. 5. I LOLed at the part where Babs Saito talked about “possible litigants” being cooperative since the fandom has heard all sorts of grumblings from the residents and guests of Ko Olina resort during the one month they were constructing the stage. It was indeed a feat that no one went to court because of the early complaints about the noise, etc. I guess you cannot argue with the millions of dollars that the concert brought into Oahu and Hawaii. Otherwise, they can complain to the Hawaii government, which has courted Arashi for about two years to put up a show at their “birthplace”. 6. The 101 on the pre-concert preparation was very interesting. One month to construct, generated 600 jobs, 20,000 fans and a 320-ft stage that couldn’t fit into the Aloha Stadium. Imagine the size of an Arashi concert and the effort it takes to build their stage alone. This is why it’s so difficult to take them out of Japan too. 7. I loved how Babs Saito acknowledged Arashi’s “core crew” as being wonderful to work with. Arashi is a team, not just the five members, and the NHK documentary shows how hard everyone works to give the fans a concert experience that Arashi has become famous for. It’s all thanks to the men and women behind the scenes, from those who make sure the boys’ backstage necessities are in order to those who manually push the carts or operate the lights and fireworks, and up to the dismantling crew. They’re all part of the Arashi team. 8. I loved Mr Kong’s seemingly innocent question on backstage passes and meet and greet. Nope sir, they don’t do that. It will be a logistical nightmare. 9. “If they had the chance to arrive by jet ski, they would have done it.” In fact, as soon as Blast in Hawaii was announced, fans were speculating how they will make their entrance. Even Arashi themselves were joking on how it will be and the odds were in favor of coming from the sea (poor Nino) or the sky (poor Sho). The chopper won (Sho, daijoubu?). Come to think of it, was Jun lurking on Twitter again?! 10. After Blast in Hawaii (2014) and Blast in Miyagi (2015), can we have a Blast in Asia or Blast in the World for next year, onegaishimasu? Johnny-saaaaaaannn? Matsumoto-san? Arashi-san! I honestly laugh when Bob said that Arashi has a fanbase that willing to travel. It’s like a must for international fans since they only have concert in Japan, except their Asia tour and their hawaii blast tour last year. It’s once in a lifetime chance for people close to Hawaii whose can’t travel to Japan. Overall it’s an interesting interview 🙂 Thanks for writing it up! Just watched, erm, listened to the interview and it’s indeed interesting to hear the thoughts and comments from the promoter’s perspective. and yes…how to see them but to travel? they leave us with no choice. life of an Arashi fan is hard dakedo happy.